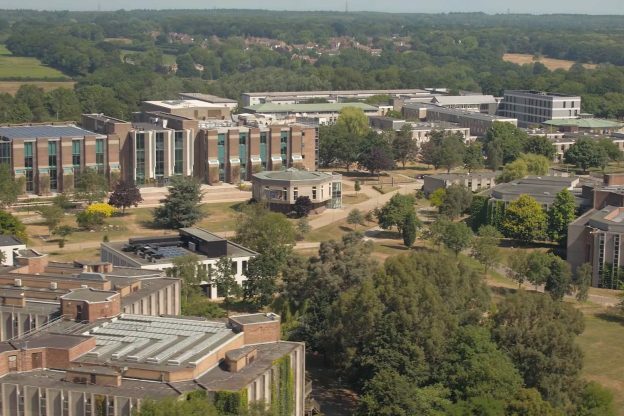 See a different perspective of our Canterbury campus; take to the skies and see the campus and Canterbury with a drone tour recorded this summer (which seems a long time ago now!). Sit back, relax, and enjoy the views as the drone explores the sights, old and new, on our 300-acre site. The Development Office commissioned a company with a CAA licence to undertake filming over the summer, to be used to in our communications with alumni and to promote the Footsteps path. The flight was approved by the University’s Safety, Health and Environment Unit, and took place early on a Saturday morning outside of term time. If you’d like to use any of the footage in University videos, please contact Chris Wenham (c.wenham-455@kent.ac.uk). This entry was posted in Campus online on 9 November 2018 by Sophia Cheraitia.